Nero dissecting his mother Agrippina. Aristotle’s view of the soul was at odds with that of his former teacher Plato. Plato posited that human souls were created by a benevolent deity, the same deity who created the entire cosmos. Human souls were immortal and all-knowing because after the deity created them, “he showed them the nature of the universe and told them the laws of their destiny.” (Plato, Timaeus) The creator God did not deign to make human bodies, rather, he assigned this task to the lesser gods. The bodies these lesser gods created were mortal and Plato describes them as fleshy prisons where our immortal souls are temporarily trapped. When these bodies decayed and died, the souls lived on and might be reincarnated into different bodies, both human and animal. Thus all souls are basically the same – they are human souls even if they reside temporarily in animal bodies. For Plato, souls and bodies were created separately and lead separate existences. For Aristotle, body and soul were a unity and different bodies were particularly suited to different souls. While Aristotle practiced dissection, he did not suggest that the study of anatomy might lead to a better understanding of human health and disease and thus improve medical practice. The person who played the biggest role in making anatomy part of the medical tradition was the Roman physician Galen of Pergamum (AD 129 – ca. 216). Galen was the central figure in the development of medicine in both Europe and the Islamic world. He wrote extensively in nearly all areas of medicine and his work were considered authoritative for the next 1500 years. Galen considered anatomical knowledge not only useful bus essential for physicians and he wrote two complete works on human anatomy, each based on extensive dissections (albeit of animals, not humans). In his book On anatomical procedures, he recommended that all physicians undertake their own dissections. The more complete a physician’s knowledge of anatomy was, the more capable he would be of treating patients. However, Galen considered himself a philosopher as well as a physician and, like Aristotle, he saw dissection as a way of intervening in philosophical debates about the nature of the soul. Galen’s second major work on anatomy, On the Usefulness of the Parts of the Body, is considerably more philosophical in orientation than Anatomical Procedures and includes extensive discussion of the human soul. Galen was influenced by both Aristotle’s and Plato’s views of the soul. From Aristotle, he took the position that “the body is the instrument of the soul, and consequently animals differ greatly in respect to their parts because their souls also differ.” From Plato he took the idea that the cosmos and everything in it had a divine creator. For Galen, this meant that each living creature’s soul had been fashioned by this divinity and each creature’s body had been purposefully designed to suit “the character and faculties of the soul.” (p. 68) Anatomical dissection revealed not only the powers of the soul but also the great skill and artistry of the divine creator. Galen considered the human soul and body to be the supreme exemplar of the divinity’s creative work. Human beings, alone among all the animals, had rational souls. And the organ that was unique to human beings and that most clearly signaled our status as intelligent beings was the hand. “Man is the most intelligent of the animals,” declares Galen, “and so, also, hands are the instruments most suitable for an intelligent animal.” (p. 69) We may not be as strong or as fast as many animals, but with our hands we can make traps, weapons and other tools to capture, outrun or subdue them. Hands not only allow human beings to survive, they also allow us to create social and political organization, learning and culture: “with his hand [man] writes laws for himself, raises altars and statues to the gods, builds ships, makes flutes, lyres, knives, fire-tongs, and all the other instruments of the arts, and in his writings leaves behind him commentaries on the theories of them.” (p. 69) Galen begins On the Usefulness of the Parts of the Body with a description of the anatomy of the human hand, and then proceeds through all the other parts of the body. Throughout the entire book he extols the marvelous construction of the human body and praises the skill and wisdom of the Creator. Further, he argued that the study of human anatomy gave clear evidence that the human body had a creator because such a perfect structure could not arise by chance. For example, after discussing the “marvelous” construction of the bones of the fingers, he declares that these bones “were not produced in any simple, accidental fashion.” (p. 87) The perfect design of the fingers implied a purposeful and intelligent designer. However, this “argument from design” was not part of a religious debate as it is today for proponents of intelligent design. Rather, it was part of a philosophical debate about whether the world was created (as Plato argued), was eternal and thus had no beginning and no end (as Aristotle argued) or arose by chance combinations of atoms (as the Stoics argued). Galen established both the practical utility and the philosophical interest of anatomical dissection. Under his influence, anatomy became an important part of medicine, and especially of medical education, but also a significant part of natural philosophy. In other words, anatomy was not important just to physicians and surgeons, but to all educated people. The study of anatomy received a big boost from the rise of Christianity in Europe. This assertion may seem counterintuitive as there is a hoary old myth in the history of science that the medieval church suppressed anatomy by forbidding dissection of human cadavers. In fact, the reverse is true. Christianity provided a far more nurturing environment for the study of anatomy than pagan Greece and Rome ever had. There were two main reasons for this. First, the Christian belief in a creator God and in the importance of the soul provided powerful motivation for the study of human anatomy. While Galen needed to argue that the human body gave evidence of a divine creator, this was widely accepted by medieval Christians. Contemplation of anatomy (and other aspects of the natural world) could inspire awe, wonder and gratitude toward the creator. It was therefore an appropriate subject for all educated Christians, not just medical practitioners. For example, Bartholomaeus Anglicus (ca. 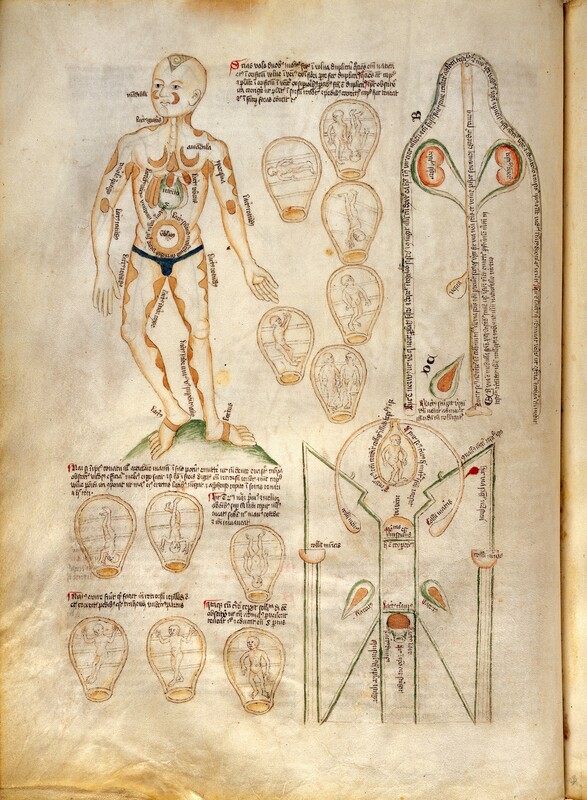 1203 – 1272) included a discussion of human anatomy in his encyclopedic work on the entire natural world, De proprietatibus rerum (On the properties of things). Bartholomaeus Anglicus, dissection scene from De proprietatibus rerum. Wikimedia Commons. The second, and related, reason that the rise of Christianity stimulated the study of anatomy is that under the influence of Christianity, taboos against cutting open human cadavers gradually disappeared. In ancient Greece and Rome, contact with dead (human) bodies was taboo. Not only might the dead soul be disturbed, but touching a dead body brought on ritual pollution. The dead were buried outside city and town limits, away from the living. In this culture, dissection of human cadavers was impossible. The only possible exceptions we know to this rule are the physicians Herophilus and Erasistratus, active in Alexandria in Egypt in the fourth and third centuries BCE. Allegedly, they were allowed to vivisect criminals who had been condemned to die. However, the source of this story is the Roman writer Aulus Cornelius Celsus (c. 25 BCE – c. 50 CE) who lived over three hundred years later. There are no extant texts from Herophilus and Erasistratus, although Galen cites them extensively, so the story of their performing vivisections on humans remains unverified. Galen himself never dissected a human cadaver, although he was able to examine a few skeletons. Both of his books on human anatomy (discussed above) were based on dissections of animals, especially Barbary apes. Christians, by contrast, developed a very different set of attitudes toward and associations with dead bodies. Although Christians believed that the whole human being, both body and soul, would be resurrected at the end of time and either cast into the fires of hell or taken up into the joys of heaven, this did not mean that bodily integrity after death was important. In fact, in the early centuries of Christianity, theologians debated the question of what would happen if a person lost an arm or a leg in life or if there body was eaten by wild animals after they died. How could they be resurrected if their body was not intact? The answer to this question, which became the official position of the church, was that God would reassemble all the pieces of the body at the resurrection, no matter how widely they had been dispersed. This meant that there were certainly no objections from the medieval church to practices like embalming, which required partial dismemberment of the body, or to burying different parts of a body in different locations, a not uncommon practice when a person died far from home. Further, the Christian practice of venerating the bodies of saints meant that dead bodies could be seen as holy and as possessing miraculous power, rather than as sources of danger or pollution. By the thirteenth century, autopsies to determine cause of death were being performed, often at the request of the family. For example, in the fifteenth century, Bernard Tornius (1452-1497), a professor of medicine at Pisa, autopsied a young boy at the request of his father. The autopsy report is in the form of a letter to the boy’s father, which begins: “I grieve over thy sad lot, for to lose one’s offspring is hard, harder to lose a son, and hardest [to lose him] by a disease not yet fully understood by doctors.” “But,” Tornius continues, “for the sake of the other children, I think that to have seen his internal organs will be of the greatest utility.” The letter concludes with a series of recommendations for preventive medicines to be given to the deceased child’s sibling so that they may avoid the same illness that carried off their brother. Anatomical illustration showing the veins. England; late 13th century. MS. Ashmole 399, fol. 18r. Wikimedia Commons. When universities developed in Europe in the twelfth century, medicine was one of the subjects taught, and the medical school curriculum was based heavily on the works of Galen. Anatomical instruction was usually part of the curriculum. In Christian Europe, unlike pagan Rome, there were no prohibitions or taboos against dissecting human cadavers. 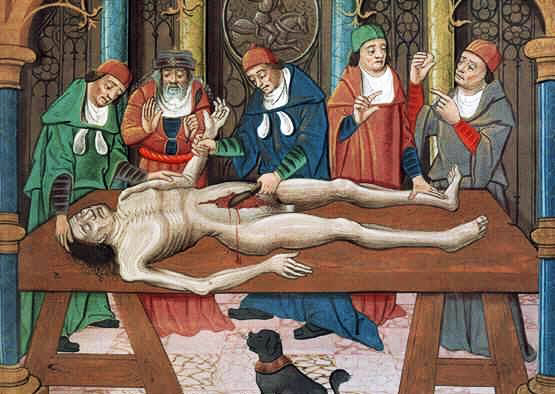 So anatomical instruction in medieval universities typically included dissection of human bodies. Bologna ca. 1300 definite evidence of dissection of human cadavers. 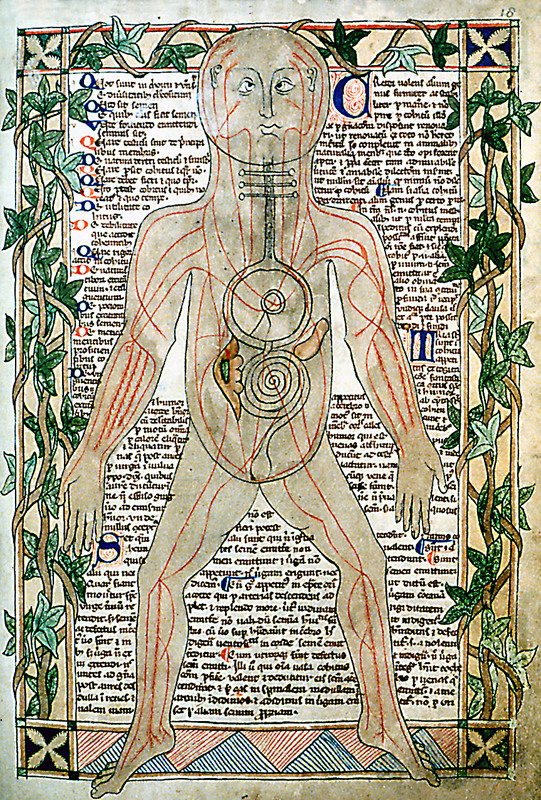 Medieval physicians by and large assumed that Galen had discovered everything there was to know about human anatomy. Anatomical dissections were used to teach medical students known facts about anatomy, not to discover new facts. 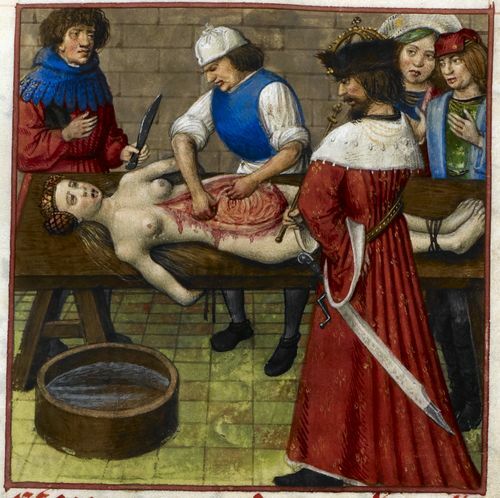 In a typical medieval anatomy lesson the professor would read aloud from a textbook (which would be based on Galen’s anatomical work) and expound and elaborate on the text for students while a technician would dissect and demonstrate the relevant parts of the body. The cadaver served as an illustration for the authoritative text. No one expected to see something in one of these dissections that would challenge the authority of Galen. By the fifteenth century, however, a small but significant number of prominent medical professors in Italian universities, especially Padua and Bologna, began dissecting human cadavers for purposes of research as well as instruction. These men – Gabriele Zerbi (1445 – 1505), Allessandro Achillini (1463 – 1512), Berengario da Carpi (1460 – ca. 1530), and Niccolo Massa (1485–1569) – each performed hundreds of dissections and published works on human anatomy in which they announced new discoveries and demonstrated errors of Galen. Katharine Park argues that one of the driving forces behind the rising interest in anatomy in fourteenth-century Italy was interest in the female body and particularly in the processes of procreation that went on inside the uterus. Interest in reproduction had multiple causes. Aristocratic Italian families were deeply concerned to produce heirs to continue family lines, especially in the wake of population losses from the plague epidemic of the mid-fourteenth century. Increasingly such families turned to university-educated physicians for help with infertility and pre- and post-natal care, rather than turning to female healers as they might have in the past. In addition to the eminently practical concern about producing bouncing baby boys, the context of late medieval Christianity was important as well. One of the central mysteries of Christianity is the Incarnation, when Christ took human form in the womb of his mother. In a period in which the cult of the Virgin Mary was at its height, studying what went on inside the uterus had powerful theological as well as practical relevance. Park asserts that for late medieval anatomists, the “uterus was the exemplary object of anatomy, the ideal type of the organ whose truth could be plumbed only by opening up the body.” (p. 106) Both Gabriele Zerbi and Berengario da Carpi included extensive sections on the anatomy of the uterus and the formation of the fetus in their anatomical works. In his manuscript notes, Leonardo da Vinci describes a book he planned to write on human anatomy which was to begin with an account of generation. Twelve drawings of foetal positions in uterus, two of them twins – Two diagrams of female abdominal anatomy, one with foetus in uterus. Wellcome images. Galen, On anatomical procedures: De anatomicis administrationibus, trans. Charles Singer (London and New York: Published for the Wellcome Historical Medical Museum by Oxford University Press, 1956). Galen, On the Usefulness of the Parts of the Body: De usu partium, trans. Margaret Tallmadge May (). Katharine Park, Secrets of Women: Gender, Generation, and the Origins of Human Dissection (New York: Zone Books, 2006).